The US Environmental Protection Agency regulates pesticides used in both conventional and organic farming by a rigorous process that is designed to protect human health. Additionally, the pesticide-residue testing process by the USDA and the FDA consistently show residues on foods are well below established U.S. EPA tolerance levels. In many cases, farmers do not have a choice but to use pesticides. And the simple fact is: if you don’t manage the pests, you don’t have the food! Pest challenges are a reality of farming and these critters do not discriminate between organic or conventional growers. Whether it’s worms in lettuce, competing weeds in the fields, or fungus on tomato plants, we would not be enjoying our abundant, varied, and affordable food supply without the use of pesticides. Most people choose to buy organic because they are concerned about pesticide residue on their food. 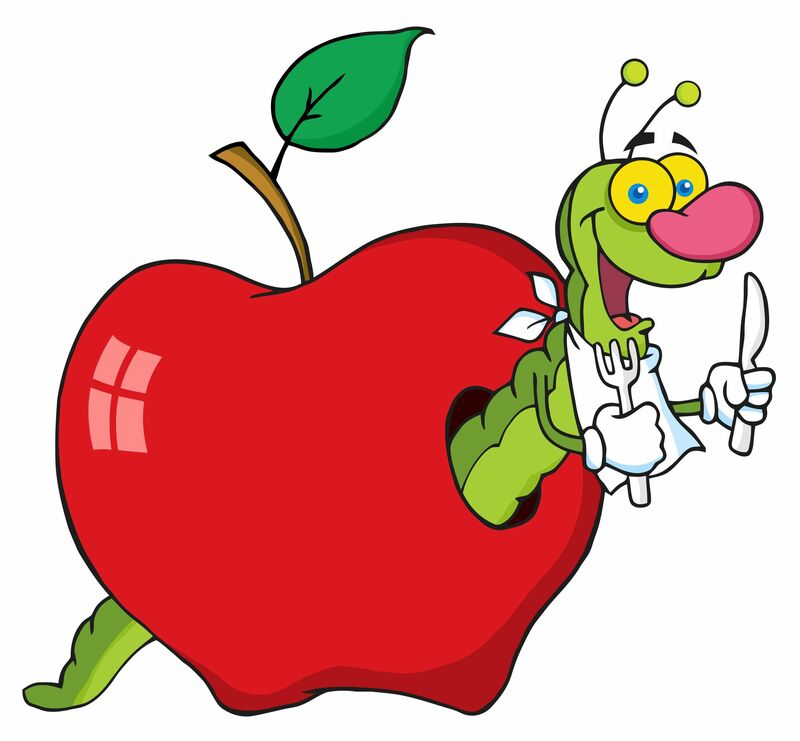 To this extent, many environmental and organic marketing groups have succeeded in convincing people that organic products are free of pesticides, therefore “safer.” But crop pests don’t discriminate between organic or conventional! There are multiple organic herbicides that have the same or even higher toxicity when compared to synthetic counterparts. Furthermore, organic pesticides residues are not tested. The truth is, “organic” is a label that identifies a specific method of food production (as outlined by the U.S. Department of Agriculture’s National Organic Program). It makes no claims on added health or nutritional benefits and doesn’t necessarily mean grown without pesticides or fertilizers! Crop pests don’t discriminate. Many people associate “organic” with “safer.” But there are multiple organic herbicides that are considered to have the same or even higher toxicity when compared with glyphosate. Furthermore, organic herbicides have very different herbicidal properties that 1) don’t fully eradicate a weed and 2) requires more passes through the field with machinery which increases human exposure as well as environmental pollutants. When these organic cultural methods fail for a crop, however, a farmer is allowed to use synthetically formulated pesticides. The NOP maintains The National List of Allowed and Prohibited Substances, a list of the synthetic substances that may be used and the non-synthetic (natural) substances that may not be used in organic crop and livestock production. It also identifies a limited number of non-organic substances that may be used in or on processed organic products. Adherence to these U.S. government restrictions is what makes a certified organic product unique. The NOP also identifies a limited number of non-organic substances that may be used in or on processed organic products. Adherence to these U.S. government restrictions is what makes a certified organic product unique. To further help organic farmers clarify what they can and cannot apply to their crops or administer to their animals, third-party testing and research facilities such as the Organic Materials Research Institute (OMRI) and state governments provide available manufacturer and product lists for fertilizers, soil amendments and pesticides allowed for organic production and/or processing under the NOP standards. The OMRI list includes over 1,000 synthetic products approved for an organic crop, pest, weed, and disease control! If an organic farmer uses only pesticides derived from botanical or mineral sources, there are some inherent risks in these products as well. These chemicals are given the same CAUTION, WARNING, or DANGER labels as synthetic fertilizers. While these chemicals may break down more rapidly than a synthetic fertilizer, this can lead to more applications or use of larger quantities of chemicals. Because of this, in some cases, the synthetic chemical may be a better option than its organic counterpart. Regardless of whether you are buying conventional or organic products, pesticides are used throughout the farming process. Pesticides are rigorously tested before coming to market. All aspects of pesticide use in modern agriculture are highly regulated and pesticide regulation is a very transparent process to both scientists and the public. The pesticides approved for use on conventional and organic crops undergo rigorous scientific evaluation by U.S. EPA, to ensure that the public is protected from health risks posed by eating pesticide-treated foods. The EPA regulatory approval process requires testing to evaluate whether a pesticide could harm humans, wildlife, plants, and surface or groundwater. It can take years before a pesticide is allowed for agricultural use. Once a pesticide is approved, in order to sell pesticides in the United States, the EPA requires a company or individual register their product. Registration provides information to the EPA about the product ingredients. The application and testing process is extensive and assures those new products brought to market are safe for use. LD50 and LC50 Many chemicals have a lethal dose (LD50) or lethal concentration (LC50), which is the amount of material, given all at once, that kills 50% of a test animal group. Acute toxicity is measured as the amount or concentration of a toxicant — the active ingredient—required to kill 50% of the animals in a test population. The LD50 and LC50 values are based on a single dosage and are recorded in milligrams of pesticide per kilogram of body weight (mg/kg) of the test animal or in parts per million (ppm). The lower the LD50 or LC50 of a pesticide product, the greater its toxicity to humans and animals. Signal words are also found on pesticide product labels. They describe the acute, short-term toxicity of the formulated pesticide product. These labels are Danger, Warning, or Caution. An important component of the EPA’s regulation of pesticides involves setting allowable limits (“tolerances”). 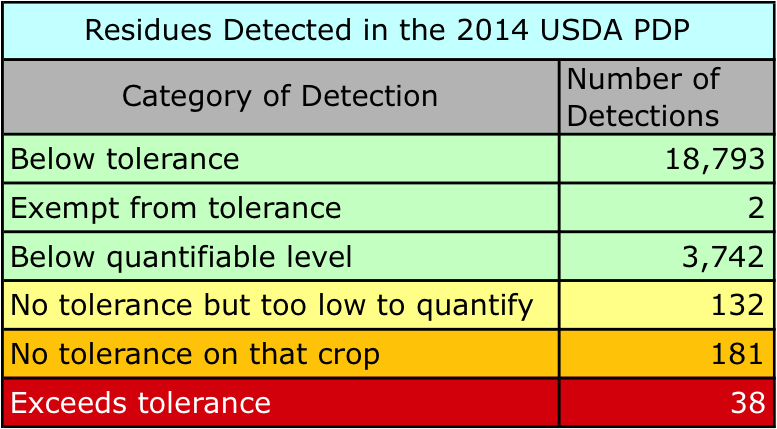 These tolerances are the maximum amount of pesticides that may legally remain in or on food and animal feed. These limits are designed with a margin of safety to protect people of all ages and sensitivities, i.e. pregnant women and immune-compromised. Tolerances, using residue chemistry and toxicity data, are set at the lowest level necessary to accommodate the maximum application rate and frequency required for the pesticide to be effective. The toxicity of a pesticide depends on the concentration and how often is it being consumed, inhaled, or left on your skin. The EPA is responsible for reasonably assuring consumers that no adverse health effects will result from consuming food treated with pesticides, even after a lifetime of exposure. All pesticides, whether organic or not, have to go through this risk assessment conducted by the EPA and similar regulatory bodies around the world. It is through this process that any pesticide, natural or synthetic, is safe when used according to the product label. Those who apply pesticides certainly have to be very careful. Consumers typically worry about the potential toxicity of the pesticide residues on the fruits and vegetables they consume. Extensive testing is performed by numerous federal and state sampling data programs to confirm pesticide residues detected are typically well below the established EPA tolerances. The USDA’s Pesticide Data Program (PDP) is one of the most comprehensive pesticide residue monitoring programs in the U.S. The PDP is designed to monitor pesticide residues on food to ensure they are safe to eat by any age group over a long period of time. The program is implemented through cooperation with state agriculture departments and other federal agencies. The PDP testing methods detect pesticide residue levels, many of which are below EPA tolerances. The Pesticide Residue Data is essential in supporting efforts by the USDA and EPA to assess the American consumer’s dietary exposure to pesticide residues through their fruit and vegetable consumption. This data is also used by the agricultural industry, environmental interest groups, food safety organizations, the FDA, the Foreign Agricultural Service, academic institutions, participating states, and the EPA. 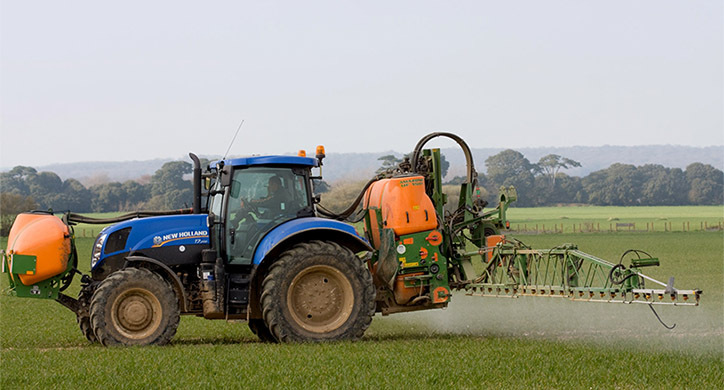 The PDP has tested over 400 pesticides (insecticides, herbicides, fungicides, and growth regulators), metabolites and isomers, including older pesticides, such as Carbamates and Organophosphates and newer pesticides such as Pyrethroids, Neonicotinyls and Triazoles. Eat your Fruits and Vegetables! Whether you shop organic or conventional, you can eat your fruits and vegetables without fear of pesticides affecting your health! Our nation’s food supply is continually tested and proven to be safe. The mere “presence” of pesticide residue does not mean that the food is detrimental to your health.